On this sunny day I was in Dorsten, a little town in the north of Essen / Düsseldorf and Cologne. In the past I was very often in Dorsten due to the Women Basketball team BG Dorsten or the Men ice hockey team EJ Dorsten. My favourite teams was playing here often, so that I was often for the sport here but sometimes for watching the town. I decided to take the train line RE14 of the private railway company „Nortwestbahn“ from Essen to Dorsten. Normally the train runs every 60 minutes to Borken/Westfalen but on Sunday morning only every 120 minutes. For the first time for a few years I was in Dorsten, again and I wondered that the station went into a bad. The windows were covered with wood. From the train station I walked to the gliding field of the glider near Wesel-Datteln canal. It really an airfield for glider. Two or three winches transport the gliders into the sky. But a little later I decided to go in the East direction, to a lock. 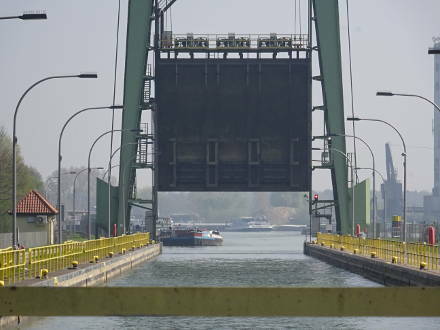 In the canal, there are barges that transport goods to the harbours in Germany. At this lock, on the picture you see the big lock chamber, there was today a brisk trade so that I could watch the sinking of the ships. One ships fit in one lock chamber. 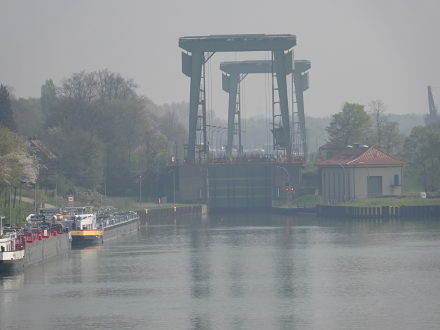 The sluice gate of the lock in Dorsten. A new ship comes in. 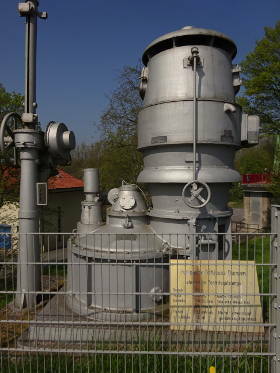 In the south side of the lock there stands a old pumping station from the year 1930. It demonstrates that the technique in this time already good. After that I went to the main street and took the bus line SB 25 (of the company Vestische) to Recklinghausen Main station. This line goes every 60 minutes on Sunday and the bus was very overcrowded. In the bus station Marl-Mitte the bus went fully than on the first part although there are other bus lines to Recklinghausen Main station. In front of the main station there is the bus station of Recklinghausen. Due to my full time I took the bus line SB 23 to the former town hall of Gelsenkirchen-Buer. The SB 23 took the part in the north of Herten, a little town between Recklinghausen and Gelsenkirchen. In Gelsenkirchen-Buer the town is working a new bus station. The old bus station was standing in front of the town hall and covered with trees. I hope that new station has trees, too. Gelsenkirchen is famous for his soccer club „FC Schalke 04“ and on my return way back to Essen I took the tram line 302 that stops at the stadium. Normally streams here a lot of supporters of FC Schalke 04 but today only a few. The second team of Schalke 04 played against the second team of Fortuna Düsseldorf (and won with 4:0). In Gelsenkirchen city centre I changed into the tram line 107 back to Essen. It was a very nice tour with a lot of new experiences. But for me the bus- and tramlines are not new. I’m knowing it for a lot of years and nothing had been changing. But I love this kind of excursion more than with my car. For that reason I will sell my 17 years old, inherited, car and the reason is, that it is too expensive for a long time. I have a monthly ticket of the transportations companies for more than 20 years. Dieser Beitrag wurde unter Ausflüge, English abgelegt und mit 302, Buer, Canal, car, Dorsten, Gelsenkirchen, glider, Herten, lock, RE14, Recklinghausen, SB23, SB25 verschlagwortet. Setze ein Lesezeichen auf den Permalink.